Evesham Country Park has changed a lot over the years we’ve been living here. It has expanded its shopping area, sadly, sometimes to the detriment of independent shops and cafe’s, but has also added some great child-friendly activities. It has a number of seasonal events and activities on offer throughout the year so it’s worth following them on Facebook to see what they have planned. 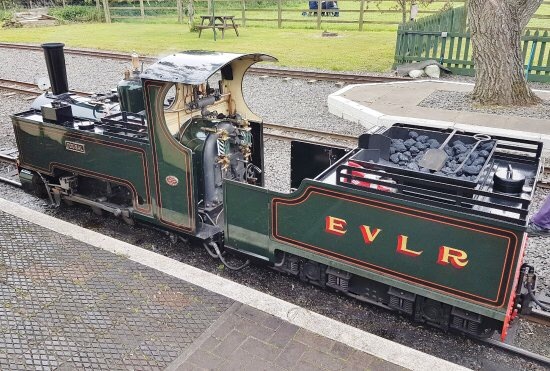 Every weekend and every day during the state school holidays the mini railway (Evesham Vale Light Railway) is operational. Trains run approximately every 30 minutes between 10.30 and 4pm and last 15 minutes. The train stops at a station half way around…you can either stay on or get off (as per a usual train!). Our advice, weather permitting, is to plan to get off and take advantage of the wonderful picnic spots and children’s play fort. You can then either hop back on the train for the short journey back to the main station or take a gentle stroll through the fields back to your car. The train carriages are all enclosed so its a great option even in the colder months. If you want to spend a bit longer in the park then you can then tag on a stroll around the various shops and cafe’s in the valley shopping area. Alternatively, you can take advantage of the 125 acres of countryside and enjoy a gentle stroll through the park. There are some paths that are pram friendly but to take full advantage of the site you’d need a baby carrier etc.